Egon, thanks for your feedback on Nature Chemistry. Good to hear your views on how the journal can be improved - I'm sure the Nature Chemistry team will read with interest. Really delighted that overall you are pleased with the functionality. Thanks for your excellent critique. I'll definitely pass this on to our technical guys. Have you had a look at one of our other papers? For instance, http://dx.doi.org/10.1038/nchem.100. 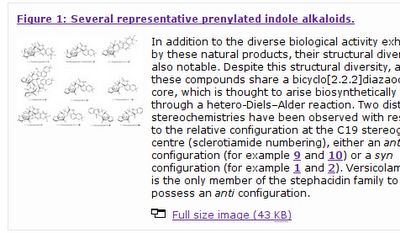 If you click on the 'show compounds' link, you'll see some more functionality. We haven't annotated all the papers like this yet, but we're working on them - Miller's paper just had too many compounds to get done in time! As regards actual data and properties of compounds...that's something for the future, but is certainly something we've discussed. I'll see what I can do about posting information about how we're actually doing this - I'm not sure what is/isn't proprietary/restricted. If anyone else in the blogosphere is reading and wants to commment - go for it. We're open for suggestion and things are reasonably flexible in these early days. P.S. Are you going to ACS meeting in Utah this weekend? Jason Wilde asked me to pass on that he is giving a talk about Nature Chemistry functionality at the InChI symposium (3pm on Sunday). If you can, stop by to see him there or at our booth (#1508) in the exhibition hall. Grace, I am not going to the ACS meeting. It's far away, takes long, and I do not have so much travel funds. Neil, I will look at that other paper too. 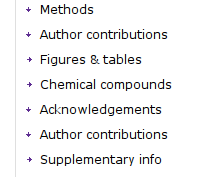 Neil, what am I missing on the Compounds table of article 100, that is not in the table of the article I picked? I do not seen any difference? Or am I just too tired and overlooking something? It's not in the compound page(s). 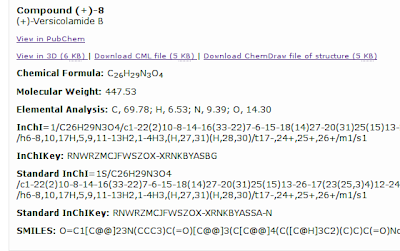 Click 'show compounds' in the right-hand nav and you should see compounds (like pyrazine/uridine) highlighted in the text. Have a play! Egon...did you notice in the Press Release here http://www.nature.com/press_releases/nchem.html that ChemSpider is linked too... "Users can choose to view the article with all of the compounds highlighted, and find out more about those compounds by linking out to other information resources including PubChem and ChemSpider." Tony, yes I saw that. 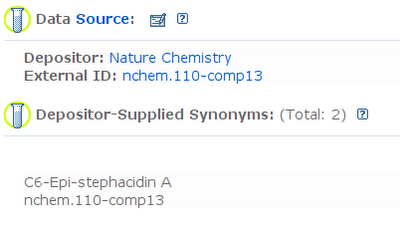 Are structures deposited in ChemSpider directly too, or will they be picked up via the next PubChem update? 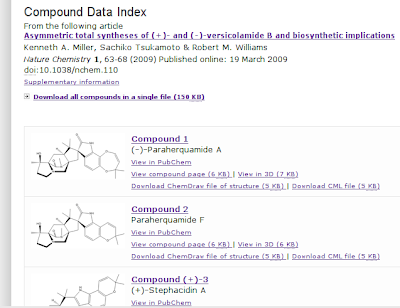 Right now we would pick them up via PubChem but I like the idea of direct deposition.